Over at Very Berry Handmade (http://veryberryhandmade.co.uk/2012/01/16/giveaway-resolved-to-sew-2012/) they are having a giveaway and being new too sewing and could use the love. The idea behind the give away is the resolve to sew which hits home to me since while I have been sewing only a few weeks. 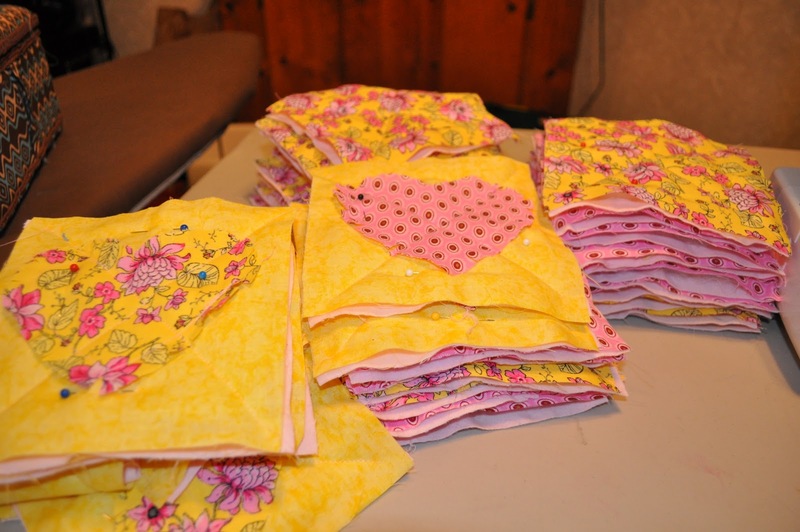 Quilting is new and fun to me and amazing with all the colors and patterns to chose from. In this post I am to say which item I would like. Material is what I need. It is a given one of the bundles. The first or the second one on the list I like the best, but all the others are nice to. What I want to do this year is make at least 1 item for each of the 5 (almost 6) members of my family. 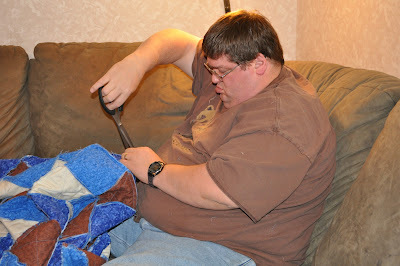 Then I would like to make my brother and sister and their spouses quilts. Doing the same for my wife's family. That is at least 15 Lap size or queen size quilts. What all is your goals for the year in quilting? So far this year has been great have 5-6 quilts done and about 8 or so in progress. Wish me luck on getting the family all quilted this year. i love the hearts! i am a huge fan of hearts of all sorts! good luck with your quilting! hey richard, are you sick of me yet? haha. i see in the pic above you are using a big pair of scissors to clip the edges on your rag quilts. if you can spare a few bucks, invest in a pair of spring loaded scissors with a blade on them that is about an inch and a half long. they are so much easier on the hands when clipping those edges and because the blade is smaller, you have more control and less chance of cutting into the quilt on accident. you have already made a lot of progress toward your goals this year with all your finishes already! great job! i'm working on a mystery quilt right now in different shades of green. i want to give it to my dad for his birthday in late february. i should be able to finish it, but just in case, i'm not telling anyone about it around here! This year, I want to get 6 Quilts of Valor made and donated. The military community and wounded warriors are near and dear to my heart. I also want to get quilts completed for 2 of my nephews and 2 nieces and finish a quilt started last year for my SIL. One of my son's is slated to get a quilt this year. The design has been chosen by him last week and it's Monopoly themed. Finally, I'm going to quilt the double wedding ring quilt I've had as a UFO for a while and put it on my and hubs bed. I think it's about time we have a quilt of our own and he loves the classic pattern. My goal is to finish about a dozen UFOs and start a dozen new UFOs, so I have something to finish next year! LOL, no there's a post on one of my blogs.